1970's: It was shown that chymotrypsinogen could not be folded in vitro without aggregates forming. An intermediate was presumed to have formed that if present in high concentration would aggregate irreversibly instead of fold to the native state. Refolding of tryptophanase showed that it aggregated only with itself, suggesting specificity. mid 80's: The biotech industry, struggling to express growth hormone, found that a single amino acid change in bovine growth hormone completely prevented aggregation without affecting correct folding. Familial amyloidotic polyneuropathy (FAP) - Affects 1/10,00 to 1/100,000 people. The protein involved is called transthyrein, which normally exists in blood as a tetramer formed by association of 4 identical monomers. In mildly acid condition in vitro, the equilibrium between tetramer and monomer is shifted to monomer, which can aggregate into fibrils. This aggregation could be promoted by possible transition to a molten globule (discussed previously with lactalbumin) like state. This has secondary structure but loosely packed tertiary structure with more exposed hydrophobes. If the concentration is high enough the molten globules aggregate. In people with the disease, mutations in the protein destabilize the tetramer, pushing the equilibrium to the monomer, which presumably increases molten globule formation and aggregation. Specifically, Val30Met and Leu55Pro mutations promote dissociation of the tetramer and formation of aggregates. Conversely, Thr119Met inhibits tetramer dissociation. The aggregates deposit in heart, lungs, kidney, etc, leading to death. Light Chain Amyloidosis; Light Chain Deposition Disease - The light chain protein is a normal component of circulating antibody molecules. Mutants in the light chain cause a destabilization of the native state to state similar to a molten globule, which then aggregates. Lysozyme amyloidosis - This protein, with extensive alpha-helix structure, is usually involved in carbohydrate catabolism. Two mutants, Asp67His and another, Ile56Thr (normal amino acid/number in sequence/mutant amino acid) destabliize the protein structure (as indicated by a decrease in the Tm of about 10 degrees C) to a molten-globule form, which probably aggregates to fibrils characterized by extensive beta structure. Alzheimers-This disease involves a defect in a protein normally found in the membrane of neurons. 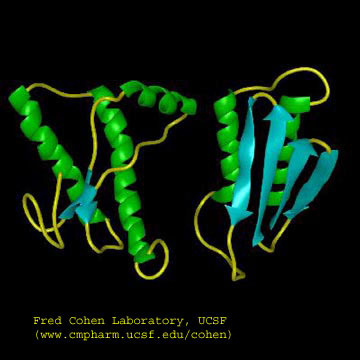 The protein, called beta-amyloid precursor protein (BAPP), is a transmembrane protein. A slightly truncated, soluble form is also found secreted from cells and is found in extracellular fluid (such as cerebrospinal fluid and blood). The normal function of these BAPP proteins is not yet clear. An endoprotease cleaves a small 40-42 amino acid fragment from this protein, forming the amyloid beta (Ab) protein. It is this protein or a mutant form of it which aggregates to form beta-sheet containing fibrils in Alzheimer's disease. Several mutations in different proteins have been linked to Alzheimer's, but they all seem to increase production or deposition or both of the amyloid beta protein. These deposited plaques are extracellular, and have been shown to cause neuronal damage. The are found in areas of the brain required for memory and cognition. The BAPP gene is found on chromosome 21, the same chromosome which is present in an extra copy (trisomy 21) in Downs Syndrome, whose symptoms include presenile dementia and amyloid plaques. Aggregate formation appears to be driven by increased expression of BAPP and hence amyloid beta protein. In addition, some mutants may serve to destabilize the amyloid beta protein, increasing its aggregation. Transmissible spongiform encephalopathies (TSEs) - Including scrapie in sheep, bovine spongiform encephalopathy (mad cow disease), and in humans Creutzfeld-Jacob Disease (CJD), Fatal Familial Insomnia (FFI),Gerstman-Straussler-Scheinker Syndrome, and Kuru (associated with cannibalism). In these fatal diseases, the brain, on autopsy, resembles a sponge with holes. In contrast to the diseases above, these diseases can be transmitted from one animal to another, but typically not between species. (However, consider the controversy with mad cow disease.) Also, the infectious agent can self-replicate in vivo. The logical conclusion is that a virus (slow-acting) is the causative agent. However, the infectious agent survives radiation, heat, chemical agents, and enzymes designed to kill viruses and their associated nucleic acids. Mathematical analyses suggested that the infectious agent in such diseases could be nothing more than a protein. Stanley B. Prusiner in the 80's isolated just such a protein which he named a prion, for proteinaceous infectious agent. Since then he and others have amassed substantial evidence to support his contention. In October 1997 he was awarded the Nobel Prize in Medicine.